The Smoothwall's time zone, date and time settings can be specified manually or automatically retrieved from a local or external Network Time Protocol (NTP) server, typically located on the Internet. The Smoothwall can also act as an NTP server itself, allowing network wide synchronization of system clocks. 1. Go to the System > Preferences > Time page. 2. From the Timezone drop-down list, select the appropriate time zone. 3. To manually set the time and date, from the Time and date panel, select Set. • Use the Time and Date drop-down lists to set the correct time and date. 4. To force the Smoothwall to automatically retrieve the time from time servers, from the Network time retrieval panel, select Enabled. • Select the required time retrieval frequency from the Interval drop-down list. • To ensure the time is written back to the Smoothwall hardware clock (the Real-Time Clock (RTC)), select Save time to RTC. Next update in shows when the next time retrieval is scheduled for. • User defined single public or local server — Enter the address of a specific local or external time server. 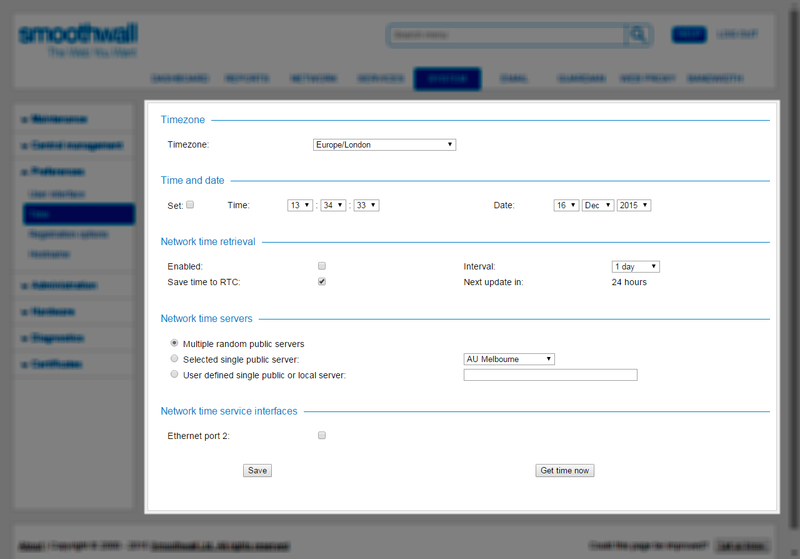 You can also use the Smoothwall to provide a time service to synchronize the system clocks of local network hosts. 1. From the Network time service interfaces panel, select the relevant interface that other network hosts connect to for time services.